And, just so you know, some of the links in this post are affiliate links, which means I might earn a commission if you click and decide to make a purchase. I never recommend products I don’t use and love. These are genius. They’re picture books with a cd in the back that reads the story aloud. We have a couple of read-along audio books that E loves to listen to and ‘read’ along with (our favorite is The Jesus Storybook Bible Deluxe Edition ), but we borrow most of ours. Check out your local library’s selection. Pro tip: read the book to your child before using the cd, just to get them used to the story and how it matches up with the pages. It’ll make it easier for them to follow along on their own, later. Drawing is always fun, but a toddler+crayons=disaster in the car. To solve this problem, we keep the Magna Doodle in the van at all times. We also take his Melissa & Doug On the Go Water Wow! Water Reveal Pad: Bible Stories * with us on all of our trips. These are reusable paint-with-water pictures that are perfect for quiet, mess-free entertainment. Pro tip: If you use a Water Wow! have a water bottle available to refill the little brush pen. Everyone knows a road trip needs a soundtrack, so put on your favorite tunes and have a sing-along. We call this “Family Choir,” and it’s a big hit with cranky infants and toddlers alike. Or, put some quiet music on to facilitate toddler naps. Disciple Mama officially recommends Wee Sing Bible Songs (FREE from Amazon Music for Amazon Prime members). Playing games is a great way for the family to interact on long trips, and it will keep your toddler’s mind engaged, too! Simple I Spy-type games are fun and help kids learn their colors and shapes. Work with your toddler to spot letters or numbers on signs. (Just remember that your rear-facing kiddos will not see everything that you do). Or, just bring the cards from your favorite toddler-friendly trivia game (Egypt to Canaan is our favorite) and ask questions. 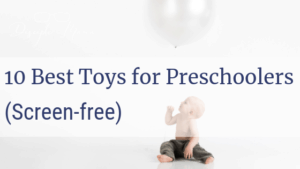 Toddlers love magnets, so why not bring them on a trip? E loves his Magna Carry Playbook Activity Set , but you can use whatever kid-friendly magnets you already have, too. Just find a mini cookie sheet and pop your magnets onto it to create a fun visual and tactile experience. E loves his alphabet magnets, but any set will work! Safety tip: Make sure the magnetic pieces are securely fastened, and DO NOT give magnets to kids who still put everything in their mouths! 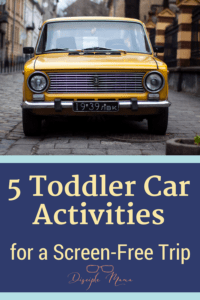 I hope these car activities for toddlers help you get on the road with confidence and reach your destination with your sanity intact. 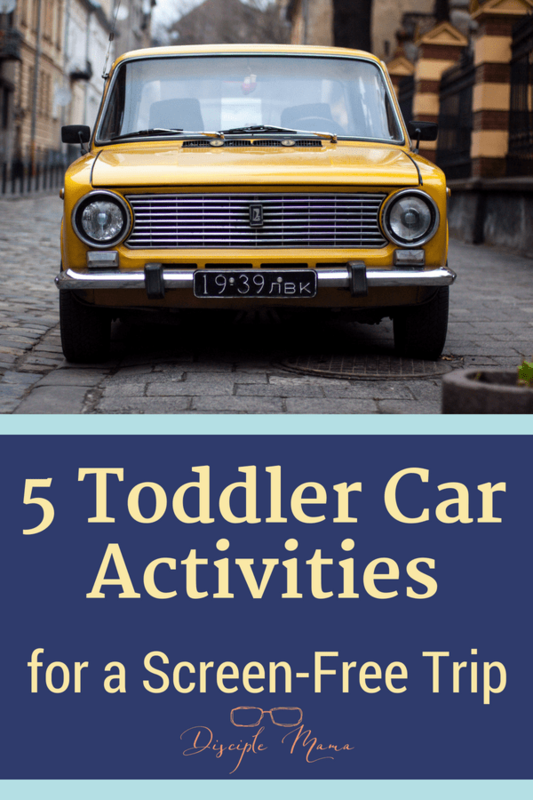 If you need more inspiration, check out these 40 activities for a road trip with kids (most of them are screen-free, too). You may still feel like bringing the iPad for backup; I get it. 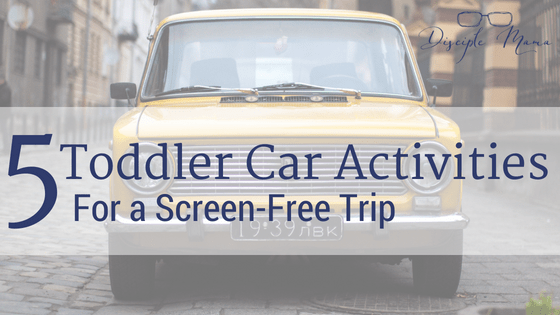 But, keep these toddler car activities on hand and you’ll have fun and feel great about minimizing screen-time on the road. Best of all, you’ll be making room for a lot of family bonding, which is what summer road trips are all about, right?! I love these ideas! I added them all to my shopping list for our latest grandchild. Back in the day, we didn’t have this type of technology, and we packed each kid a tote crate for trips that held their own crayons, markers, coloring books, books for reading, and favorite toys. I also read aloud from the Chronicles of Narnia and the Little House on the Prairie series. It was great fun in the van (even the teens listened in), but sometimes a strain on Momma’s voice. These reading books and piped in music by blue-tooth should make an absolutely delightful screen-free trip for the little ones. Great ideas, Brianna! Melinda, I love the idea of reading aloud to my kids (my husband would probably enjoy it too, actually), but I always get SO carsick if I read in the car, so I can’t! Audio books are the next best thing, but I love your more personal suggestion! 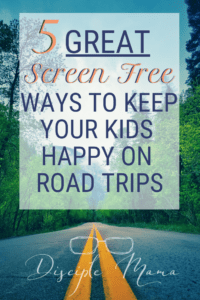 I hope that your grandchild enjoys these solutions for screen-free travels! These are amazing ideas. I think they would work for someone in our situation too—I commute over an hour each way with my little one in tow four days a week. I’ve been trying to come up with ideas on how to keep him engaged. Audible has Your Story Hour albums, so we listen to one in Spanish sometimes. And for the trip home I can’t wven finish strapping him in without him demanding his snack. But he’s been a trooper, and I haven’t had to resort to a phone or tablet for him yet! Amy, I had no idea that you were commuting with your little one! That’s impressive…I’m not sure I have the fortitude!! Your Story Hour is great, and snacks are always a hit! I hope that you have a chance to try out some of these suggestions and that they help keep him happy and busy on those daily drives. I think it’s really great that you’ve managed to keep him off screens while doing this every day! Thanks for visiting my blog! So happy to hear there are parents who want screen free trips! I fear too much screen time and not enough “face time” is hurting families. Kudos to you for encouraging others. Thank you, Beth! There are quite a few of us out there, though I think we’re definitely the minority. 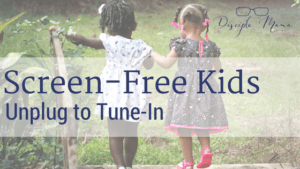 I just know that I feel good about keeping my kids off screens as much as possible for as long as possible, and I love sharing ideas (and hearing ideas from others) about how to do that in today’s world! 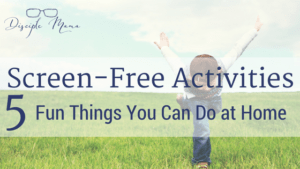 I love your travel ideas for families who want to stay acreen-free as much as possible. It takes hard work and intentionality to set your kids up to enjoy other activities while driving. Thank you for sharing your ideas and raising awareness. These are the similar to the types of activities we had for our kids before all the screen options. We also played games like looking for letters of the alphabet on signs and made up stories aloud together. Looking back, I just treasure the time together. I appreciate your outstanding ministry to families! We love the alphabet game, too, though my kids are rear-facing in their carseats still, so they can’t play too well, yet! (Well, one of them doesn’t know the alphabet, either!) But I hadn’t thought of making up stories together. E, my 3 year old, would LOVE that! We’ll have to try it when we travel for Christmas soon! Thanks for stopping by and for your great feedback and ideas, Melissa! I think my favourites were the magnets. Hi Edna, magnets are a big hit with my son! Thanks for visiting my blog and commenting today!